Don't worry, what you're looking at isn't exactly real but actually a full replica of fatty tissue in a human body. Not that it makes it any better because that's pretty much how fat looks like inside your body. Which, well, oh my god gross. I don't want a single ounce of this slimy goopy jiggle on my body anymore. The body fat replica is sold by Anatomy Warehouse for 23 bucks and is "made of soft, pliable, long-lasting vinyl plastic". 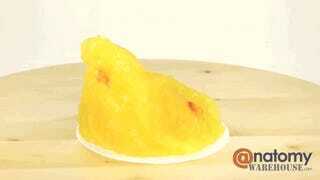 The volume of the model is equivalent to what 1 pound of human fat would look like. Which is just as slimy and oily as you would imagine. But as disgusting as this pound of fat is, I think if I put this blubber model on my desk, I would instantly make better life decisions. The all seeing eye of the one pound god of fat would prevent me from ordering fatty feasts during lunchtime, make sure I get up to walk around every hour and cause me to shudder and hurl every time I look at it.